C1622. GEORGE SZELL Cond. 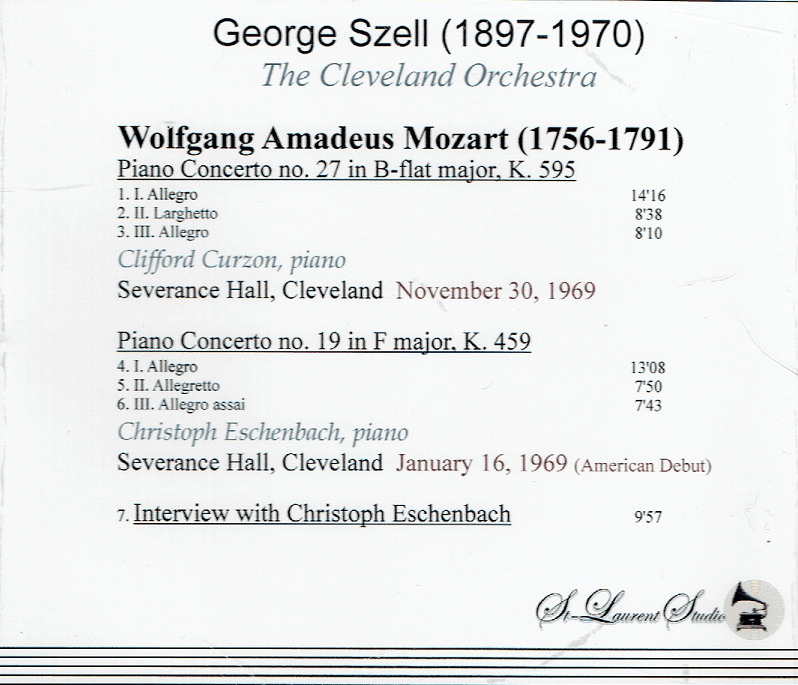 Cleveland Orch., w.CLIFFORD CURZON: Piano Concerto #27 in B-flat, K.595 - Live Performance, 30 Nov., 1969; w.CHRISTOPH ESCHENBACH: Piano Concerto #19 in F, K.459 - Live Performance, 16 Jan., 1969 (Eschenbach's American debut) (both Mozart, both Severance Hall); Eschenbach interview with Martin Perlich. (Canada) St Laurent Studio YSL T-545. Transfers by Yves St Laurent. “In the sports world commentators will wryly speak of a player as not quite at the level for his sport’s Hall of Fame but not too far below. Such players would qualify for a Hall of the Very Good. It strikes me that what we have here is a Hall of Fame pianist and a Hall of the Very Good pianist. Of course, the comparison is inherently unfair: Clifford Curzon was at the very peak of his career at age 62, whereas Christoph Eschenbach was making his American debut in 1969 at the age of 28. But by placing the two pianists on the same disc with the same orchestra and conductor from the same year, St. Laurent Studio invites the comparison. Clifford Curzon was one of the most highly regarded pianists of his era, and his playing of Mozart’s final concerto here is pure magic. In lyrical passages, particularly in the second movement, one could be listening to a great bel canto soprano. The relationship between Mozart’s piano concertos and his operatic writing was pointed out by the late Charles Rosen, and it seems central to the way Curzon plays. The vocal quality of the writing remained forefront in my mind as I listened to this performance. At the same time there is a spark and wit in the music’s more ebullient moments and a buoyancy to the rhythms. Curzon and Szell always brought out the best in each other (their classic Decca recording of Brahms’ First Piano Concerto is a prime example). Szell found a warmer, lyrical side when accompanying Curzon, and Curzon’s rhythmic articulation became a bit firmer (though I would argue that it was the conductor who made the larger adjustment). This performance might appear superfluous, because there are multiple Curzon readings of Piano Concerto #27 available conducted by Adrian Boult, Benjamin Britten, Daniel Barenboim, Rafael Kubelik, and even an early Decca with Szell. I know most, but not all, of them. For vitality, concentration of energy, and beauty, I would rank this new account as highly as any. The Szell/Eschenbach pairing is very fine also but not quite at the same level. Eschenbach seems a bit more studied, his forte a bit harsher, his line a touch less flowing. Heard on its own this would be counted as a lovely performance. Heard after Curzon’s it loses some of its luster. Although they are placed on the disc in the order of the headnote, I would recommend listening to them in reverse order so that you don’t immediately start comparing Eschenbach’s playing with Curzon’s. There is a great deal to recommend this performance, particularly the remarkable precision of intonation and ensemble from one of the world’s great orchestras. In both readings the wind soloists are outstanding. "Christoph Eschenbach began studying piano at the age of eight, taught by his adoptive mother. She quickly realized his talents and enrolled him in the Hamburg Hochschule für Musik, where he studied both piano and conducting. As a boy he won First Prize in the 1952 Steinway Piano Competition, and in 1962 he took second prize in the Munich International competition; however, it was with his first prize at the Clara Haskil Competition in Montreux, France, in 1965, that he finally made his mark. 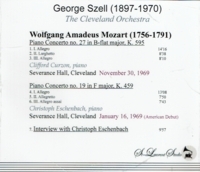 This new notoriety led to a London concert debut in 1966, and a prestigious debut with the Cleveland Orchestra and George Szell in 1969 [above]. 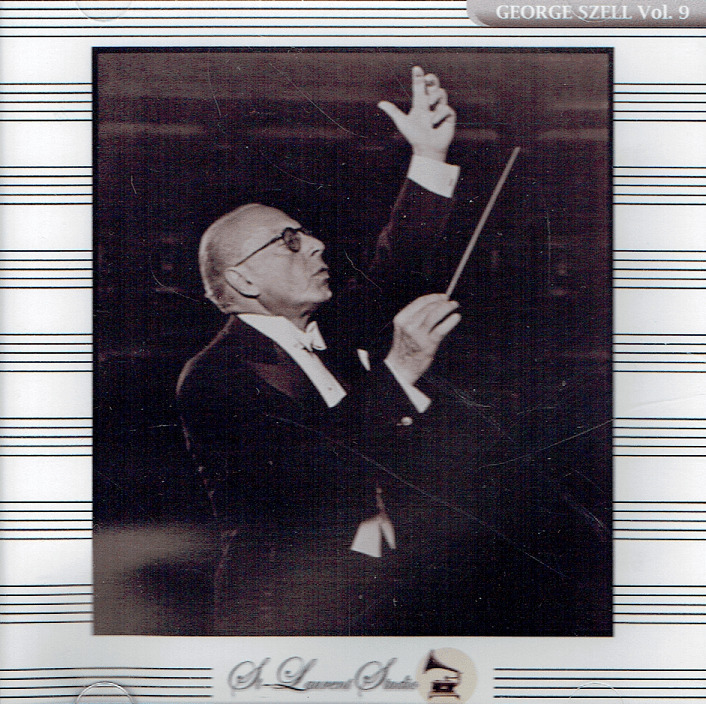 Szell was impressed with his musicianship and gave him lessons in conducting, starting a close relationship that lasted until Szell's death in 1970. Eschenbach was soon essaying a wide repertory in concert tours throughout Europe and America. Notable in his programs were a large number of works from 20th century composers, such as Bartok, Henze, Rihm, Reimann, Blacher, and Ruzicka; however, his performances of Mozart, Beethoven, and Schubert were considered revelatory.